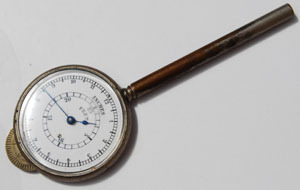 I don’t know when chartometers or map measurers were invented or by whom but they were certainly being produced in very similar forms to those that can still be bought new today by the latter half of the nineteenth century. I suspect that their origins are somewhat earlier than that. This page is limited to those with a dial for reading the measurement. Opisometers are on the Miscellaneous page. 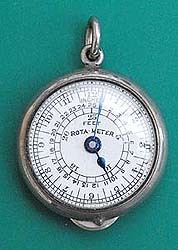 They are sometimes also called rotameters and could be used to measure the speed of rotation of a work piece in a lathe. 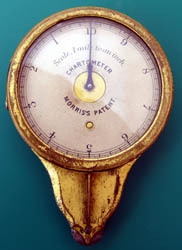 Morris’s Patent Chartometer dating from the late nineteenth century, invented by E R Morris, with hinged front glass so that card dials can be interchanged for different map or drawing scales. The card scale is for one inch to the mile. Made by the Morris Patent Engineering Works, Birmingham. (ref: W F Stanley, 1900, p306). Serial No 203. Dial diameter 47mm. This is the first type with a gilded brass case. At the bottom of this page is a Chartometer No 2 that has the addition of a totaliser (revolution counter). 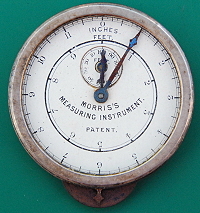 Morris’s Patent Measuring Instrument with three scales reading to 12 inches, 10 feet and 100 feet. Dating from ca. 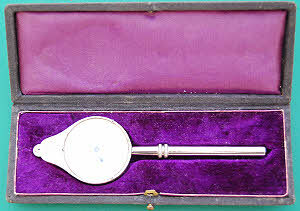 1900 the instrument has a Morocco covered snap case lined with mauve silk and velvet. Made by the Morris Patent Engineering Works, Birmingham. Morris’s Patent Wealemefna, also dating from the late nineteenth century and invented by E R Morris. This one appears to have a nickel silver case, possibly plated, but they were also sold with sterling silver and eighteen carat gold cases. This one was priced at seven shillings and sixpence in 1900, the others being 17s 6d and £2 17s 6d respectively, in the price list at the back of W F Stanley’s book. Intended to be hung on a watch chain, it is just 25mm diameter overall. 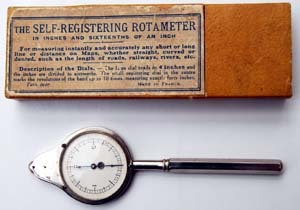 Rota-Meter dating from about 1900. This one appears to have a nickel silver case, probably plated, but they were also sold with sterling silver cases, sometimes attached to propelling pencils. 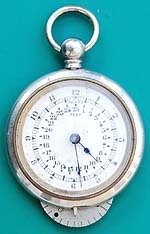 Same size dial as the Wealemefna but slightly more bulbous case. J Halden & Co catalogued these in 1902 at five shillings (nickel & gilt) and 8s 6d (silver). In W F Stanley’s 1912 catalogue they were 5s 6d. HC map measurer, 1 3/16 inches diameter. The inner and outer dials read to 25 feet and twelve inches respectively. The wheel is graduated in 1/32 inches. Early 20th century, made in France. 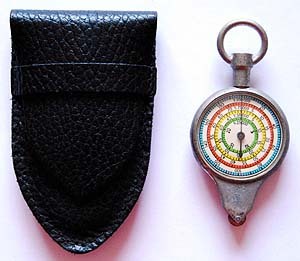 The Universal Map Measurer made in France by HC (Henri Chatelain), early to mid twentieth century. It has scales for inches to miles or verstes and centimetres to kilometres. One rotation of the hand = 99 cm or 39 inches. Dial diameter 30mm. The instructions continue on the underside of the box. The handle can be unscrewed. 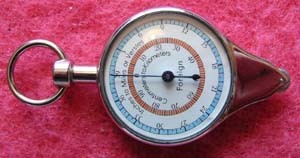 The Self Registering Rotameter made in France by HC (Henri Chatelain), early to mid twentieth century. It has a scale of 0 to 4 inches x 1/16 inches and a revolution counter counting up to 10 seen through a little aperture near the centre of the face. Dial diameter 30mm. The instructions continue on the underside of the box. 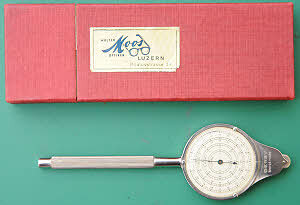 Keuffel & Esser, New York, map measure, made in Switzerland. Nickel plated brass case (much of the plating has worn off through use but it still works perfectly). Outer hand reads 0 - 12 inches, inner hand 0 - 25 feet. Measuring wheel is graduated in 1/32 inches. Dial diameter 31mm. Catalogued in my 1927 catalogue as no: 1694A and in 1949 as no: 1743. Keuffel & Esser, New York, 62 0315 map measure, made in Switzerland. Nickel plated brass case. Outer hand reads 0 - 12 inches, inner hand 0 - 25 feet. Measuring wheel is graduated in 1/20 inches. 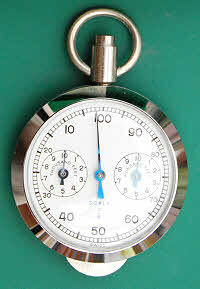 Dial diameter 30mm. 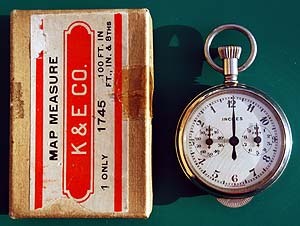 This is basically an updated version of the map measurer above, dating from the 1960s. The inner dial and hand were now coloured red, the handle ribbed, the hands simplified and the divisions on the measuring wheel decimalised. 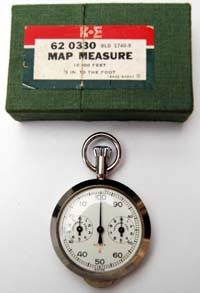 Map measurer by Compass of Germany. It has a magnetic compass on the reverse and a propelling pencil handle. It is complete with card box. Scales are inches to miles or verstes, and centimetres to kilometres. One rotation of the hand = 99 cm or 39 inches. Dial diameter 30mm. 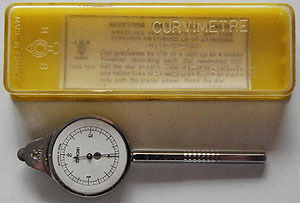 A double sided map measurer/curvimeter made in Germany by ATM. It is complete with card box which has instructions on the lid. Scales are inches to miles or verstes, and centimetres to kilometres on one side and statute miles, kilometres, nautical miles, 1 inch to 1 mile on the other. One rotation of the hand = 1 metre or 39 inches. Dial diameter 31mm. 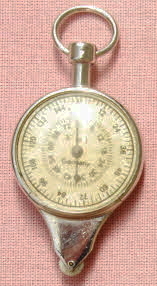 Hamilton Watch Co, USA, Model 331 map measurer. Scales are 0 to 39 inches (outer) and 0 to 99 cm (inner). Dial diameter 31mm Obtained from the USA. Complete with green card box with instructions pasted to the bottom of the box. 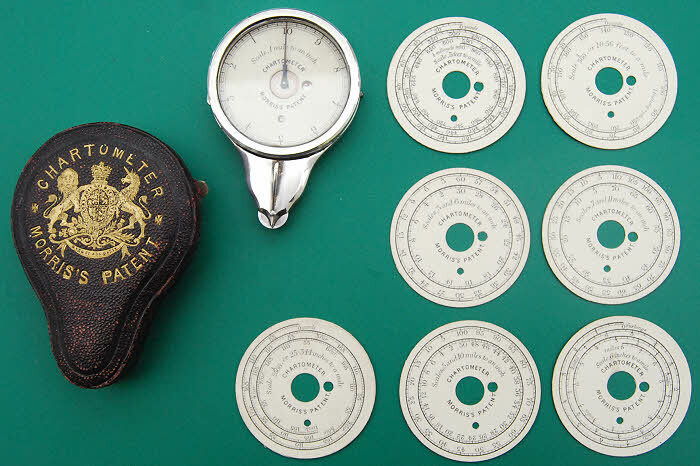 Possibly dates from the 1950s when the Hamilton Watch Co, Lancaster, Pa, are known to have diversified into measuring instruments. Keuffel & Esser 62 0330 old 1740-8 Map Measure 10,000 feet 1/8 in to the foot. Made in Switzerland by Derby, probably in the 1960s, this map measure has dials reading to 100 scale feet, 1,000 and 10,000. Pushing down the knurled knob zeroes the instrument. Dial size 35mm. Box and map measure are in mint condition. Original price is penciled on the box as $14. Purchased from the USA. This instrument was intended for use with very large scale maps and plans. 1/8 in to 1 ft is 1/96 scale whereas 1 in to 1 mile is 1/63,360. 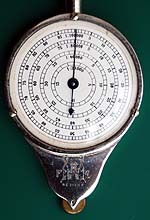 Keuffel & Esser map measure with three dials reading to 10, 100 and 1,000 inches. The instrument is zeroed by pushing down the button. It was actually made by Derby in Switzerland, as probably were many of the other K&E map measures. Purchased from the USA. Keuffel & Esser 1745 map measure with three dials reading to 12 inches, 10 feet and 100 feet. The instrument is zeroed by pushing down the button. This is an earlier instrument than the previous two with more rounded edges to the case. Made in Switzerland.Purchased from the USA. 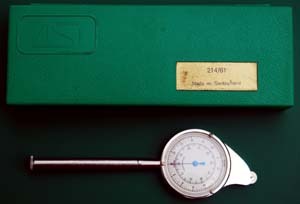 ASI 214/61 map measure made in Switzerland with its green plastic case. Scales are 0- 39 in and 0 - 99 cm. Loosening the knurled cap of the handle enables the handle to swivel when following curved lines. Purchased from the USA. 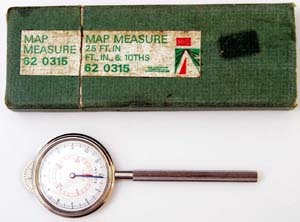 HB Curvimetre Map Measurer Model 52MA, made in France. 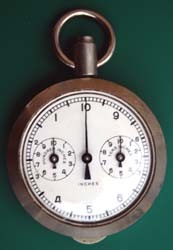 The dial reads to 4 in by 1/16 in divisions and there is a totaliser (revolution counter) enabling it to measure to 40 inches. It probably dates from the 1960s There is a small instruction leaflet. 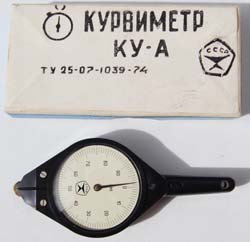 Soviet Army KY-A Curvimeter type TY-25-07-1039-74 in card box with instruction leaflet/quality certificate dated 28 March 1980. Obtained from the Ukraine. Dial on one side reads from 0 to 100cm and on the other from 0 to 39.4 inches. Dial diameter 33mm. The mechanism is enclosed in a plastic case. Unused condition still in protective wrapping paper inside box. Map measurer made in Germany complete with card box and instruction leaflet. The front face scales are inches to miles and centimetres to kilometres. On the back face there is a spiral inches to miles scale reading to 100 miles. There is also a revolution counter, counting to 5 revolutions, which also functions as a reset wheel. One rotation of the hand = 1 metre or 39 inches. Dial diameter 35mm. 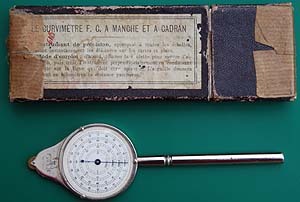 HB Curvimetre Map Measurer Model 56MA, made in France. 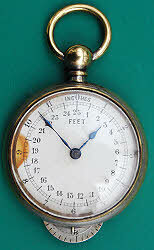 The dial reads to 10cm by 1mm divisions and there is a totaliser (revolution counter) enabling it to measure to 1 meter. It probably dates from the 1960s There is a small instruction leaflet. 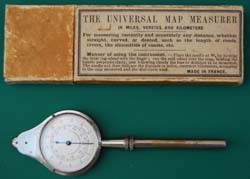 Another double sided map measurer. Scales are 1/20,000; 1/40,000; 1/80,000 and 1/100,000 on one face, and 1/25,000; 1/50,000; 1/75,000 and 1/200,000 on the other face. It has a leather case. Probably made in Germany. Nickel plate, possibly over zinc alloy. 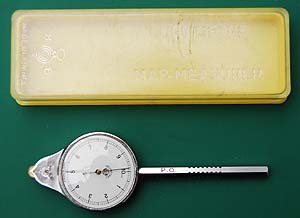 This map measurer, probably made in Germany, has fractional scales (1/25000, 1/50000, 1/75000, 1/200000) on one face and miles, kilometres and nautical miles at one inch to the mile on the other. 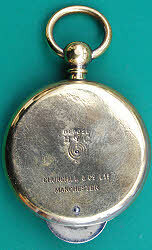 An early example of an HC map measurer retailed by Churchill & Co Ltd, Manchester. 37mm diameter. Nickel plated brass case. 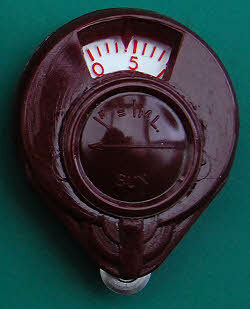 Dial reads from 0 - 12 inches and 0 to 25 feet. Bone handled, FC map measurer made by Fritz Chatelaine of Neuchatel, Switzerland. Its scales are: inches to miles and cm to km. This tiny plastic map measurer is just 2.5 inches tall. On one side it is graduated for a scale of one inch to one mile and on the other for a scale of one centimetre to one kilometre. It probably dates from the 1950s and might have been a give-away at petrol stations. Fullerton 2981 drawing measurer made in Western Germany. It is double sided and is for the scales of 1/8, 1/4, 3/16 and 3/8 inch to the foot. It was used by an American architect and given to me by his wife. It has its instruction leaflet and a blue/clear PVC wallet. 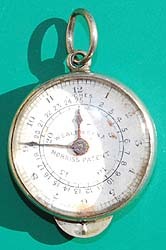 Morris’s Patent Chartometer No 2 invented by E R Morris, with hinged front glass so that card dials can be interchanged for different map or drawing scales. The card scale fitted is for one inch to the mile. Made by the Morris Patent Engineering Works, Birmingham. Serial No 882. Dial diameter 47mm. The case has a retailers gilt stamp on the silk lid lining for John Browning, 111 Minories & 63 Strand, London. The additional card dials are for: 5 feet to a mile; 1/500 or 10.56 feet to the mile;3 and 6 miles to an inch; 7 and 11 miles to an inch; 1/2500 or 25.344 miles to an inch; 5 and 10 miles to an inch; 6 inches to a mile. Silver? plated case. John Brownng was at 111 Minories from 1868 to 1875 and at 63 Strand from 1872 to 1897 so this instrument would date between 1872 and 1875. 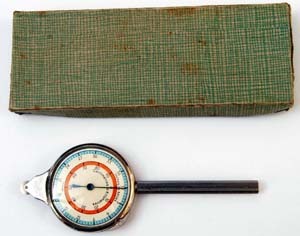 Fritz Chatelaine map measurer that is double sided and has a fitted case. Scales are: 1/20,000, 1.40,000, 1/80,000 and 1/25,000, 1/50,000, 1/100,000. The BUX Map Measure. It has a paper envelope with the instructions for its use on. Measures miles on a map scale of 1”:1 mile. Maker unknown. Plastic body, probably 1950s. Double sided Derby, Switzerland map measurer. Scales are: 1/20,000; 1/40,000; 1/80,000; 1/100,000;; 1/25,000; 1/50,000; 1/75,000; 1/200,000. Retailed by Werner Moos, Optizen, Luzern, Pilatusstrasse 34.